Kayaking portal with news, articles and links to kayak related websites. 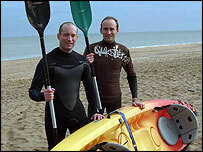 Mike Humber and Travis Spencer, both of Broadstairs, Kent to embark on the crossing to France. The crossing from St Margaret’s Bay to Cape Gris Nez was expected to take five to seven hours, Mike Humber said. And he said the pair had been kayaking for a few years and had gradually increased the length of their journeys before deciding last year that they wanted to cross the Channel. “We’ve been training over the winter and know we can do that sort of distance,” he said.